This Module has 4 inputs and 1 output. The inputs accept Bipolar signals (audio) OR DC (CVs). The input channel routed to the output is selected by the voltage patched to either the DC or the AC jack. The Offset pot allows you to adjust the offset of the incoming CVs. The DC jack has an attenuator to allow you to scale the CVs. The AC jack is scaled for ~10Vp-p. This module will function properly all the way into super sonic frequencies. I'm going to put it up in my For Sale Thread now and get a page set up on my website tomorrow. I'll post some video up soon as well. I couldn't say for sure, as I have no means of testing it. It will go higher than the audible range. The slowest components the signals go through would be the V2164 or the TL07X. I am under the impression that the TL07X were too slow for video, but I honestly have no experience in the matter. So long as the V2164 can keep up. The PCB has a ground plane. I could definitely be persuaded to swap the TL072 with a LM6172. This has a make noise design vibe that i like. Let't hear that demo now! I'm working on the demo. It's taking a minute though. I'll get something to post up soon! Are there any audible clicks or pops as the different channels are cycled or is there some kind of "crossfading" going on? There would be no problem using this as a regular 4>1 audio mixer, right? Clean sound? The signal path is clean. There's not a whole lot of circuitry it has to travel through. 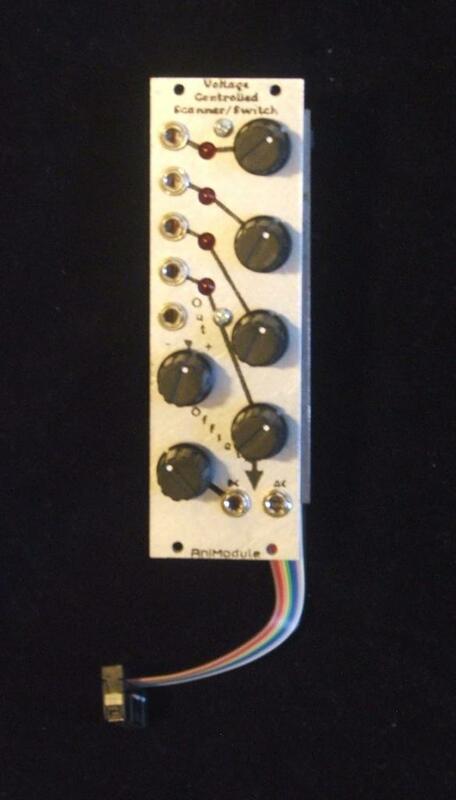 I wouldn't use it as a conventional mixer though, because only one channel appears at the output at a time. You can scan at a very high frequency, but you will hear some artifacts from the channels switching. There can be a slight click when you switch waveforms at a non zero point. Say you switched from the peak of a sine to the middle of a ramp, that effectively creates a small pulse and you're going to hear it, just like you would on your sampler if you chop at a non zero point. It's very minimized and I haven't had any problems with it. As well as the little RC lowpass smoothing filter I placed in with the switching circuitry. You could increase the value of the smoothing cap on the switches, and slow the transistion even more, but that would decrease the maximum frequency you could effectively scan at. I'd be happy to do that for you, but be aware of the tradeoff. If you switch between the inputs and the input waveform amplitudes/phases don't match well you'll get pops/clicks/hum/whine. When you do match amplitudes however, it sounds very cool. It can work as a "sort of mixer" for phase locked signals that way but it's not really a proper mixer.